Introduction: issues relating to notifying women of their breast density. Breast density (also known as mammographic density) refers to the white or bright areas on a mammogram and is a problem for screening mammograms because it can mask breast cancers that are present. Generally, breast cancers appear white on the mammogram, and are difficult to distinguish from the dense area which is also white. Women with higher percentage breast density are more likely to have a so-called ‘interval cancer’, defined as a cancer detected within 24 months after a ‘normal’ mammogram. Interval cancers are more likely to be larger than cancers detected by screening. Larger cancers are often associated with lymph node metastases and can have a worse prognosis. Breast density is also a risk factor for breast cancer. This means that, for women of the same age and body mass index, those with higher breast density are more likely to develop breast cancer. However, most women with high breast density will not go on to develop breast cancer. When considering a woman’s individual risk of developing breast cancer, it is important that breast density be considered together with other risk factors (such as age, family history, and body mass index). Why don't all BreastScreen programs notify women about their breast density? Notifying women of their breast density is a complex issue for Australia’s national breast screening program, for women with high breast density, and also for doctors advising and treating the women. More scientific evidence is needed to guide decision-making around how to measure breast density. It is unclear what women with high breast density, and their doctors, should do to manage their breast cancer screening and breast cancer risk once they have been notified. More evidence is required to tailor screening programs to benefit the individual woman. Tailored screening might include more intensive screening of women with higher breast cancer risk, and reduced frequency of screening of women with lower breast cancer risk. The program aims to avoid unnecessary harms. Potential harms of breast density notification might include unnecessary anxiety, costly supplementary testing for some women potentially leading to false positives, and finding a slow-growing cancer which would not be harmful during a woman’s lifetime (leading to unnecessary treatment). However, in their position statement, BreastScreen stated that “…in the future, breast density may have a role in determining the frequency and method of an individual’s breast screening.” BreastScreen Australia is currently working with clinicians, public health researchers and laboratory scientists to provide the scientific evidence needed to determine how the existing screening program could be altered to improve cancer detection in women with increased risk of breast cancer. BreastScreen Australia is a mass population screening program, funded by Australian tax-payers, and any decision to change policy must be approved through the appropriate government committees - right up to the Council of Australian Governments’ Health Council. Governments will not support changing policy without robust evidence of the benefits. The introduction of digital imaging into the BreastScreen Australia program is a good illustration of our governments pro-actively supporting evidence-based new screening technologies, where the benefits could be clearly demonstrated. However, BreastScreen Australia has acknowledged that high breast density both increases a woman’s risk of breast cancer and reduces the sensitivity of screening mammograms. The reduced sensitivity of mammograms to detect cancer in women with high breast density prompted BreastScreen Western Australia to start notifying women of their breast density about 10 years ago. It remains the only state in Australia to do so. The absence of national clinical guidance for the management of women with high breast density and breast density notification poses challenges for BreastScreen Australia, health practitioners, and women. Women who do know their breast density, and their medical practitioners, are confused about what is appropriate screening and management of their breast density. While there is concern from BreastScreen Australia that notifying women of their breast density can cause harms, some feel the policy of not notifying women of their breast density can also cause harms, and denies women a fundamental right to know. Women who have had a breast cancer missed due to having high breast density are understandably angry that they had not been notified that their screening mammogram had reduced sensitivity to detect breast cancer, and that they were at increased risk of developing breast cancer. OK, that sounds complicated, what can be done? The INFORMD alliance believes that national clinical guidelines should be urgently developed with all stakeholders so that women with high breast density can be notified about their breast density. These guidelines will inform best practice for WHO to notify, HOW they should be notified, and WHAT information will be communicated. Receipt of information about breast density will enable women with high breast density to be part of decision-making around how to manage their breast cancer screening. This knowledge might also lead women with high breast density to have increased awareness of the importance of self-breast checks, and of a healthy lifestyle to reduce their breast cancer risk (such as maintaining a healthy weight). We are working collaboratively with government, health professionals, and the community, and believe that the best progress is made by a well-informed shared conversation. A comprehensive and independent review of the scientific and clinical studies around the impact of breast density on cancer detection and risk, clinical ethics of disclosure, new technologies such as digital breast tomosynthesis, and supplementary testing practises such as ultrasound and MRI, to assess the benefits and potential harms of these technologies. Establishment of a panel of experts representing BreastScreen, including GPs, radiologists, surgeons, radiographers, breast care nurses, scientists, screening experts, clinical ethicists and most importantly, women, who are given the task of developing evidence- and/or consensus-based Australian clinical guidelines for breast density management and notification. Breast density notification guidelines and screening recommendations will hopefully result from all this work. In February 2017, INFORMD member A/Prof Wendy Ingman met with Steve Georganas, MP for Hindmarsh and Deputy Chair of the Standing Committee for Health, Ageing and Sport, to discuss how to progress breast density notification in Australia. With his assistance, INFORMD submitted information on this issue, and a call for development of clinical guidelines, to federal Health Minister Greg Hunt. Following this correspondence, Minister Hunt stated that he would request his staff to discuss possible scope and timing of new guidelines for health professionals around breast density reporting. 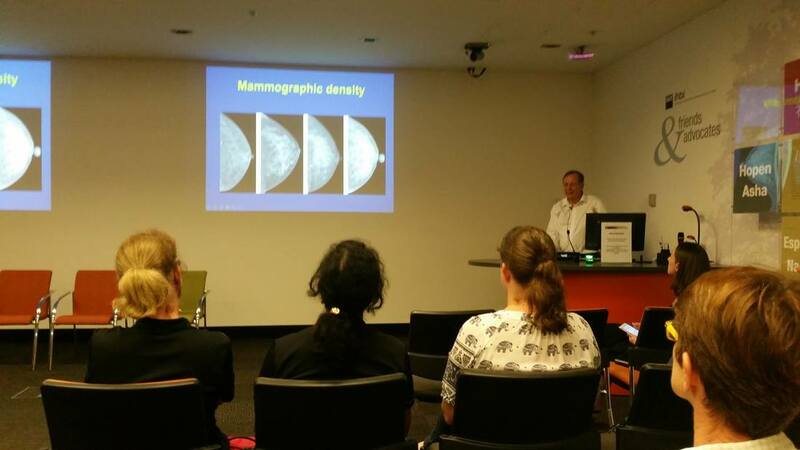 In March 2017, INFORMD members Prof Rik Thompson and Dr Honor Hugo, together with members of the Australian Centre for Health Law Research at Queensland University of Technology, hosted a symposium, public lecture and forum on breast density. The forum brought together scientists, lawyers, industry personnel, clinicians, consumers, along with representatives from BreastScreen Australia and acknowledged the medico‐legal framework around notification, the growing desire and expectation amongst Australian women to know their breast density status, the importance of establishing consensus on the issues around breast density notification, and a willingness to work together towards identifying applicable solutions. In May 2017, the McGrath Foundation produced an online eLearning lecture featuring INFORMD member A/Prof Wendy Ingman speaking about “The significance of breast density in screening, detection and incidence of breast density” as an educational tool for breast care nurses and other healthcare professionals. The lecture can be viewed here. Also in May, Breast Cancer Network Australia and the McGrath Foundation joined our call for development of clinical guidelines, writing letters of support to the National Health and Medical Research Council of Australia. In August 2017, INFORMD member Prof Rik Thompson was successful in petitioning the Clinical Oncology Society of Australia through a broadly circulated Discussion Paper on breast density to establish a working group that would seek input from all stakeholder groups and, together with Cancer Council Australia, develop a Fact Sheet on mammographic breast density to support healthcare professionals. Also in August, the Commonwealth Department of Health commissioned an independent review of the scientific studies on breast density, which is currently underway. This review will form the basis of a revised BreastScreen Australia position on breast density, and potentially the basis of new clinical guidelines. Also in August, INFORMD member A/Prof Wendy Ingman met with representatives from the Commonwealth Department of Health to discuss development of national clinical guidelines by an expert multi-disciplinary panel. The panel would draw on the information gained from the independent review to develop evidence- and/or consensus-based clinical guidelines. This proposal is currently under consideration. In December 2017, INFORMD member Dr Jennifer Stone from the University of Western Australia launched a study to assess the impact of breast density notification in Western Australia. Preliminary results were presented to BreastScreen Australia in April 2018, click here to read a draft summary. the full report will be published soon. In August 2018, INFORMD member A/Prof Wendy Ingman hosted a workshop in Adelaide to identify the ethical and legal issues around breast density notification. The workshop presentations, published here, explored the clinicians' and patients' perspectives of the issue. A full report of the workshop and the issues identified will be published soon. If you would like to assist our advocacy for development of Australian clinical guidelines for density notification, please contact the BreastScreen in your state to express your support. Links to the BreastScreen programs are below. You can also include us in your correspondence (contact@informd.org.au) so we can keep track of the support we receive. Should women still go to BreastScreen for their screening mammograms? BreastScreen Australia has been highly successful in reducing the numbers of women dying from breast cancer since the program’s inception in 1991, by diagnosing breast cancers in their earliest stages and enabling effective treatment for thousands of Australian women. The challenges of reading mammograms of women with high breast density is not a new issue for the program. Continually evolving science and the introduction of new technologies such as digital mammography have contributed to improved diagnosis for all women – including women with high breast density. We encourage women between the ages of 50-74 years to have free regular mammograms through BreastScreen services across Australia. These services are also available for women over 40 years of age. You don’t need a doctor’s referral to book an appointment. Two-yearly mammograms reduce breast cancer-associated death through early detection of breast cancer. Even if your mammogram shows no evidence of breast cancer, we encourage all women to be ‘breast aware’. This means knowing how your breasts normally look and feel, checking them regularly, and if you notice a persistent change - see your doctor.